Happy Holidays! I seriously can’t believe it’s already that time of year. But, I’m happy it is because I LOVE holiday entertaining, especially having parties with several different appetizers and festive drinks. Unfortunately, it seems every year I have less and less time to entertain. But, I don’t let that dissuade me. 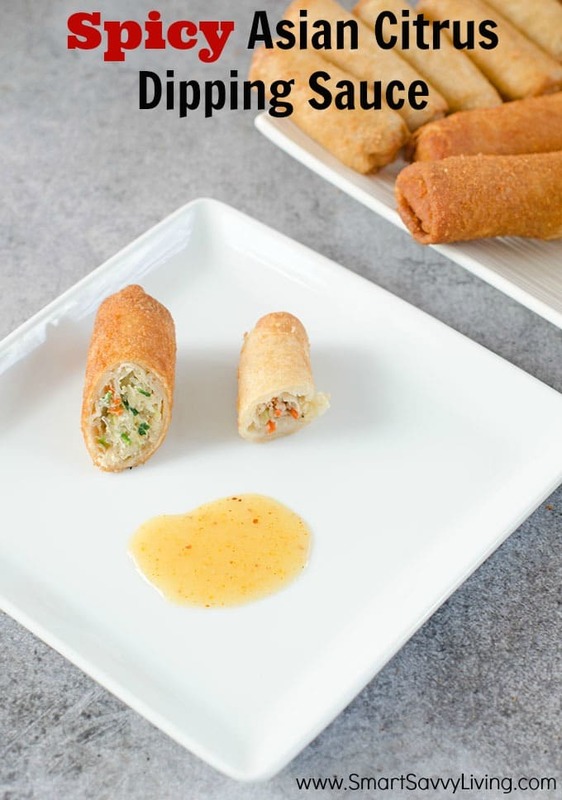 Luckily, these days they are plenty of delicious pre-made items like these Tai Pei Egg Rolls and Spring Rolls I paired with my homemade Spicy Asian Citrus Dipping Sauce Recipe. Our friends and ourselves are all huge fans of Asian foods, especially spring rolls and egg rolls. But honestly, as much as I love cooking, I just don’t have time to make up a bunch of rolls as they can be SO time consuming to make. Thankfully, Tai Pei’s frozen egg rolls and spring rolls are pretty much just as good as I could make myself, complete with a crispy wrapper and and tons of yummy veggies, but a lot easier to make. Plus, I can purchase them at a great price while stocking up at Walmart for a lot less than it would take to purchase all the ingredients to make them myself. 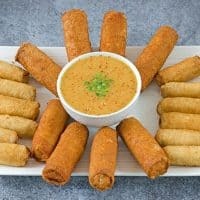 While the dipping sauce both the egg rolls and spring rolls come with is quite tasty, I do like to add a homemade touch by making my own dipping sauce. Afterall, dumping a few ingredients into a blender and pressing the on switch is a heck of a lot easier than chopping and rolling for an hour or more! 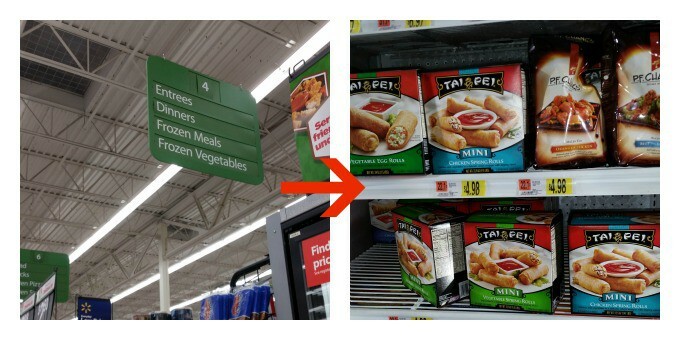 Note: If you look for Tai Pei Egg Rolls or Spring Rolls at your local Walmart, I found them in the entree aisle and not the snack aisle! I especially like that Tai Pei wraps their rolls in plastic, instead of just placing in the box so I know they will be fresh. All I have to do is preheat the oven and flip them halfway through. It really doesn’t get much easier than that, folks! This time, I wanted a lighter dipping sauce to go with the rolls, so I opted to make a citrus dipping sauce. The resulting recipe isn’t too sweet, but also not too sour, with just a hint of sesame and a nice punch of spice from the pepper flakes. In fact, I loved the sauce so much I almost ate it straight from the dish with a spoon. I even think it would be a great marinade for some chicken or fish. I so appreciate that the rolls are wrapped in plastic to preserve freshness! For more delicious Asian restaurant-inspired dishes check out Tai Pei on Twitter, Facebook, and Pinterest. I just love the color of this spicy Asian citrus dipping sauce with the specks of red! Place all ingredients into a blender and blend, with lid on, on high for about 30 seconds, or until well blended. You'll still see specks of the red pepper flake. Taste for flavor. If you'd like it more acidic, add a bit more lime juice or rice vinegar. If you'd like it sweeter, add more marmalade or a drizzle of honey. Pour into serving dish and garnish with chopped green onion, if desired. Serve with a variety of egg rolls, spring rolls and/or dumplings. 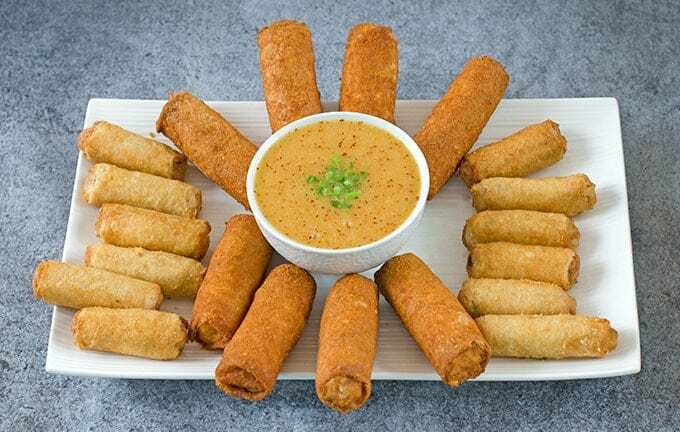 Will you enjoying this Spring Rolls with Spicy Asian Citrus Dipping Sauce Recipe with family and friends this holiday season? I love Tai Pei but I never thought about serving them, I”m going to have to try this. I don’t really get into Asian food that much, but my siblings can’t get enough of it! They all would love these egg rolls. That sauce looks delicious and sounds like something my family would really enjoy! Those spring rolls would be a great thing to stock in our freezer for those times when you want something yummy fast that even my vegetarian daughter can enjoy. This sounds amazing! My husband would love it. I keep seeing these around the web and the pictures are just mouth watering. Definitely peeking my interest for our next family Chinese meal. Yum, those look so good. I need to stock up my freezer in preparation for nights spent out shopping. I love spicy foods of any type, and my kids LOVE spring rolls- so this is a win/win all around! They don’t have to touch the sauce! 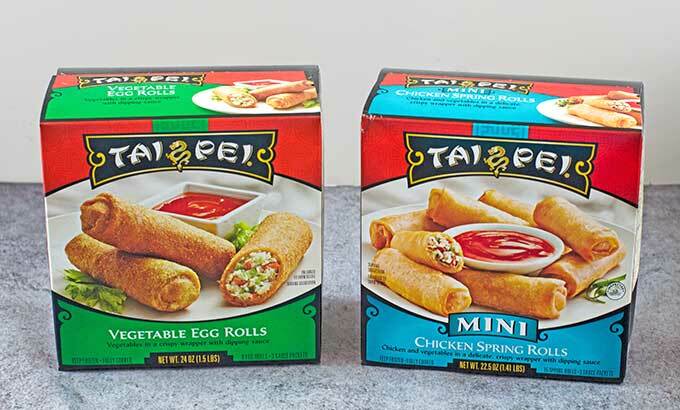 I don’t care much for egg rolls, but I love the MINI version! (Isn’t everything better when it’s smaller?!) My husband would love these. Quite possibly. Asian cuisine is one of our favorites. Dinner would not be complete without eggrolls. I’d like to try the vegetable egg rolls in that sauce. Spicy citrus sounds delicious. both my husband and daughter love spicy – me not so much. But it might be worth making it for them! Love sweet and spicy! Asian food is one of my favorites. This is such a quick dinner idea – or great appetizer idea for a party. 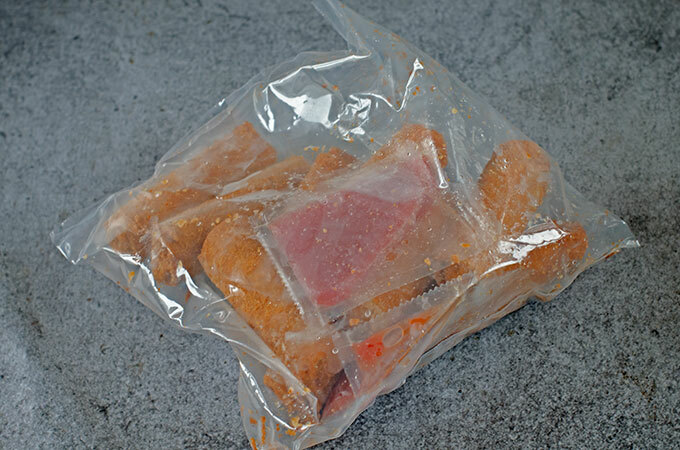 I even have a box of these in my freezer! Thanks for the recipe.